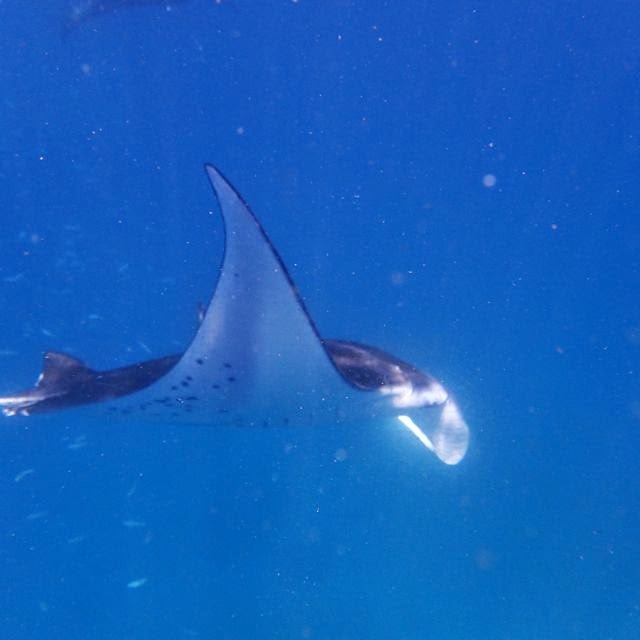 Galley Wench Tales: Manta Rays – My Marquesas Swimming Mates! plankton, same as the school of fish he’s swimming amidst. 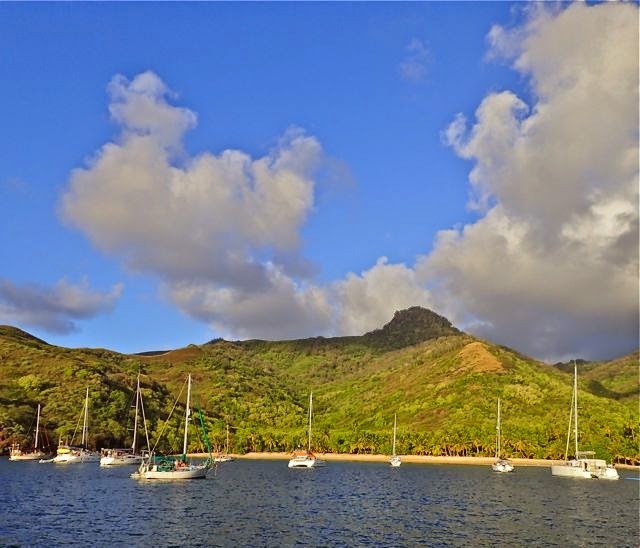 The Marquesas Islands, while rich in marine life, are not known for good snorkeling. Like Galapagos, plankton provides a solid foundation for the bottom end of the food chain. It makes for happy sea life, but murky water, generally. As well, majestic Marquesas mountains funnel much silt down into anchorages. “We could see our anchor in 27 feet of water! And then there’s the mantas,” enthused cruising friends Julie and Ken from Kia Ora via satellite hotspot SMS. They left Hiva Oa ’s Tahauku Bay opaque waters for the clear waters of Hanamoenoa, Tuahata, the Marquesas island neighboring Hiva Oa. dark topside and white, lightly speckled underside. Among Marquesas cruisers, Hanamaenoa is well known for its popularity with people-friendly manta rays. We’d heard the same was true at Fatu Hiva, but while I saw an eagle ray there, the mantas didn’t approach our boat, or any others when I cruised the anchorage via kayak and snorkel. I was itching for a good snorkel experience. 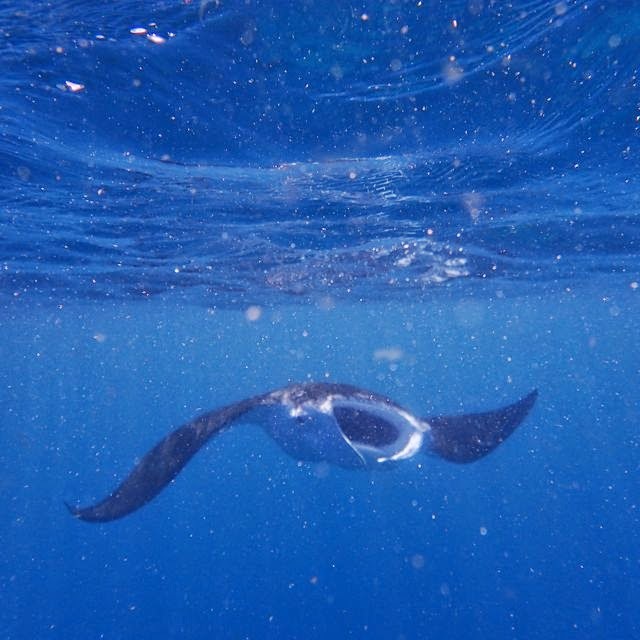 Eye-level, manta, wings a flappin’ and coming my way! I remind myself, they’re said to be friendly! No reports of attacks. My last really good snorkeling goes back over a year, to Conception, Bahamas, in April 2014. There we darted in 20-30 feet deep sculpted reefs with nurse sharks, large Nassau grouper and a wide array of colorful Caribbean fish. We also peered at all sorts of fish tucked into the mysterious mangrove-filtered clear waters. and its reflection from the water’s surface. This cruising season, I’ve barely even tried getting in the water, except to shampoo my hair in saltwater-friendly biodegradable shampoo. In Galapagos, we did swim with some turtles and eyeball a cave full of blacktip sharks, (note: watch for that in a future catch-up Galapagos blog post) but the plankton heavily marred the visibility. Worse, I kept getting bumped and kicked by other snorkelers, due to the strong currents and many rocky protuberances. I value my space, and deliberately swam away from some sharks and turtles to enjoy some no-contact snorkeling…. Shortly after dropping anchor in Hanamaenoa we saw a large manta ray – 5+ feet, wingtip to wingtip -- circling our boat and practically brushing against the snorkeler from the boat anchored just fore of us. I’d planned to snorkel that afternoon, but quickly donned my snorkel gear, grabbed my underwater camera, jumped in and followed the flashing white wingtips of several mantas and excited squeals of other snorkelers. 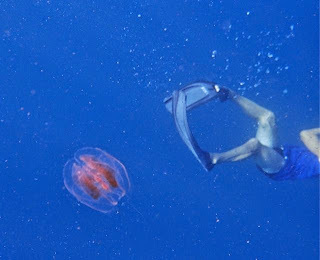 “It’s like watching a ballet!” exclaimed another snorkeler. Indeed, pirouettes best describe the motion the mantas made in their fabulous water ballet. 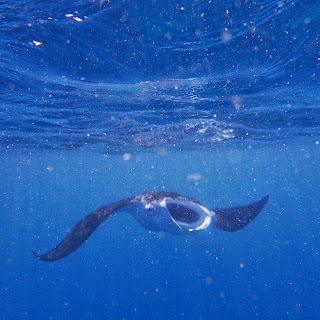 Wide white mouths agape, slurping plankton, wings outstretched and flapping, the mantas swam speedily -- straight at us! At the last minute, they’d either dive, passing right below, or flip sideways, nearly touching while we felt their wingtip wake flow past. I got the sense they were playing with us, mocking us a bit, good-naturedly. I sensed they wanted to be touched, but held still when they zipped by. I fumbled with my camera. After destroying a couple supposed “water cameras,” I was loathe to test mine underwater – but couldn’t resist at least trying to capture at least a smidgen of their exotic underwater dance in still and video. (Watch for some short manta video segments I shot to be added to this post when I have more power for my Mac and internet time). 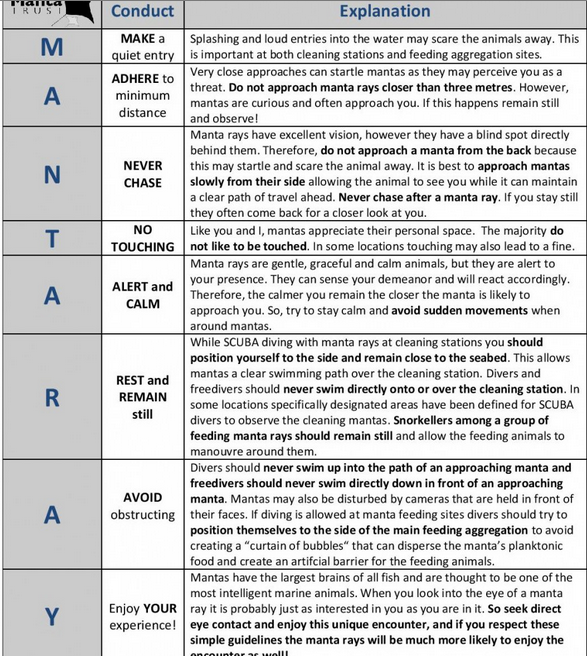 Guidelines for swimming and snorkeling from Manta Trust. Instinctively, I did what they suggested;). Later, I heard third-hand, that a former Cousteau employee (who also swam with the mantas when I did) said the mantas we like attention seeking kids – they wanted to be the one noticed in the pack of mantas. At one point, I saw at least nine mantas swimming around us! 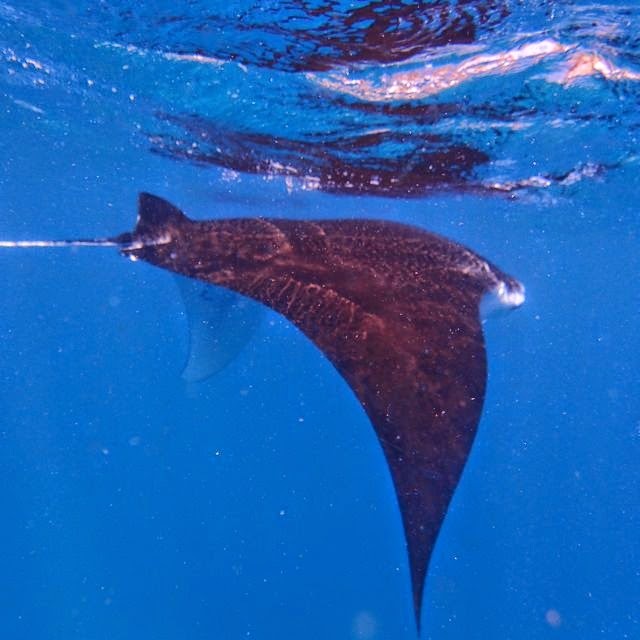 Two local Marquesas men who currently live on Hanamoenoa beach (watch for more on a post about them) told us that it’s okay to touch the mantas; they like it – just stay away from their tail! Still, despite the temptation, I'm glad I didn't given the Manta Trust Guidelines. I’m not sure if I’ll be lucky enough to swim with mantas again. I hope they'll be as friendly as the Hanamoenoa mantas. Swimming with the mantas at Hanamoenoa is one of the most exciting and thrilling wildlife interactions I’ve ever experienced. Seeing the 12-wide caddy-grill-like mouth of a whale shark swimming at me in Western Australia is in the same league (and inspired I suspect record-breaking speed on my part to get the heck out of the way! 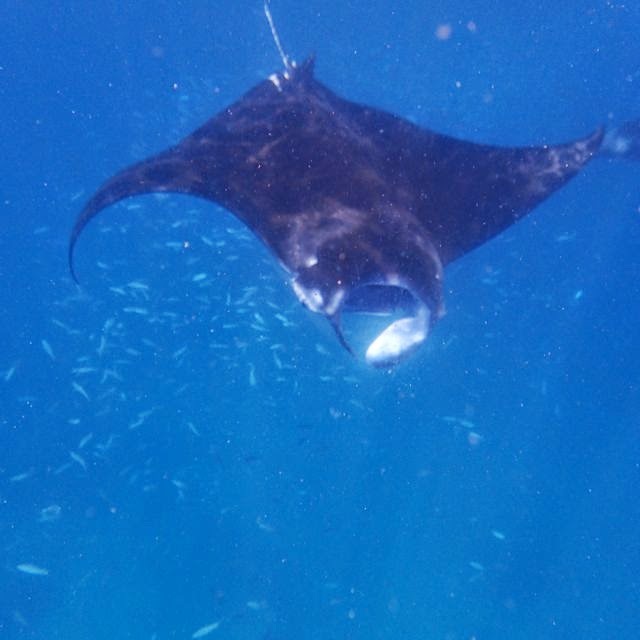 ), but far less intimate and far more short-lived than snorkeling with these raucous manta rays. For the rest of the day, and beyond, I felt like I was walking on clouds. the second time I swam with the mantas in Hanamoenoa. Why do I get the sense there’s more than a few plates of mashed potatoes with gravy coming my way soon? Bring it on! I’m hungry for more! to come to swim with manta rays! Hanamoenoa Tuahata, French Polynesia (S9.54.494 W139.06.342) was our third Marquesas island stop. We are currently on our fourth Marquesas island stop, Ua Poa (S9.21.537 W140.02.867). Hiva Oa was our first Marquesas Islands stop Fatu Hiva was our second. Nuku Hiva will be the next and last island we stop at in the Marquesas, before moving onto the Tuomotos, which are still part of French Polynesia. 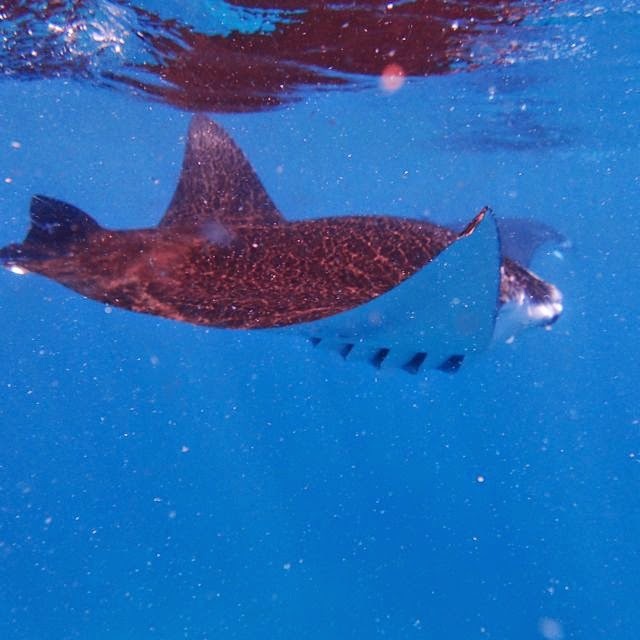 Check back periodically for an update with video shot of swimming with Hanamoenoa manta rays. Given limited internet and power - it may be a while.